You'll be £25.00 closer to your next £10.00 credit when you purchase The British Army Against Napoleon. What's this? Despite the bewildering number of tomes devoted to the Napoleonic wars, much basic data as been hitherto unavailable to anyone other than the most ardent scholars. McGuigan and Burnham have collected a tremendous treasure trove of information in a readily accessible form. 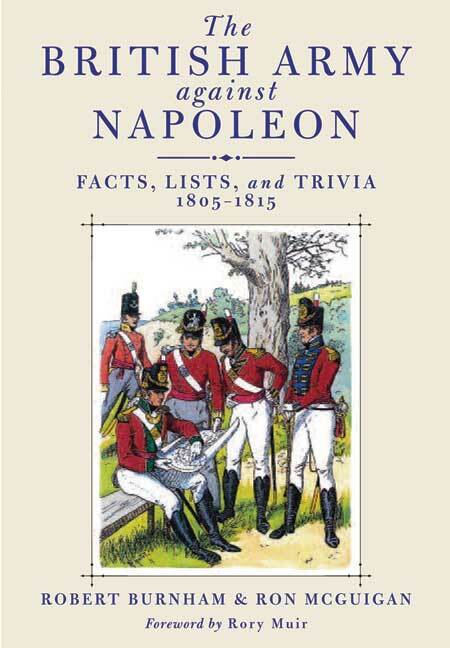 Other books may tell you how many regiments were sent on the expedition to Hanover in 1805, but The British Army against Napoleon will tell you where every single regiment in the British army was stationed, who were their honorary colonels, and give you a list of all the barracks in Britain with the number of men they were designed to hold. The material in these tables has been collected from countless primary sources and official publications such as the Army List, London Gazette, Wellington s Dispatches, regimental histories, artillery manuals, and handbooks. This title is intended to be a book of facts to assist research, rather than as simply a reading work. The 1805 starting date of the coverage reflects the year that Britain went on the offensive against Napoleon. There are tables that list such topics as all the recipients of issued honours and awards, casualties in action, those from disease, as well as the seniority of officers of the numerous campaigns and battles. Also featured are such aspects as prize money, the pay of officers of differing ranks, as well as the tax they paid, pension charts for widows, a Major Holmes who received the Military General Service Medal with an amazing 14 clasps – 13 for battles in the Peninsula and one for Egypt. Fascinating stuff! Threaded throughout the book are snippets of trivia, highlight some interesting aspects of the period, such as 30 officers in the British army in the Peninsula being cashiered for various reasons, but not one for desertion. Some 30 monochrome illustrations are included, as well as numerous tables, reference sources and an index. A book that anyone interested in the British army surely cannot afford to overlook. This is a book, which has the power to surprise, amuse and amaze, pretty much wherever and whenever one dips into it. I recommend it wholeheartedly. McGuigan and Burnham have collected a tremendous amount of valuable and intriguing information in a readily accessible form. Other books may tell a reader how many regiments were sent on the expedition to Hanover in 1805. But The British Army Against Napoleon details where every single regiment in the British Army was stationed and who were their honorary colonels. Where else could one find not just the pay of different ranked officers, but the amount of income tax they paid? The vast wealth of knowledge contained in this book makes it indispensable to anyone interested in the history of the Napoleonic Wars in particular and the British Army as a whole. Every once in a while , a book appears which takes the breath away at the amount of research which has gone into a project and is presented in such a deceptively effortless way. The present book is of course not one you can sit and read at a sitting-but if you did it would be in a state of wonder and amazement at the work which has gone into it. but despite the slightly disserving title ,it is not just a random collection of 'hey wow' facts. there are explanatory sections putting information into context at the beginning of each chapter. It is a joy to dip into,whilst providing bedrock data of how the war against Napoleon functioned.As a reflection of the amount of work- not just by the authors,as they fully acknowledge in the introduction-which has gone into this,the cover price is a bargain. If this is your subject area,this is the book you will keep going back to again and again to check a fact,or compare notes.as a reflection of the researchers art it is also a tremendous success. A benchmark and an essential purchase. As a writer and lecturer on Napoleonic subjects I collect all manner of books pertaining to the period. There are times when I want an answer to a simple question that such books can provide very easily and quickly. The British Army Against Napoleon is going to be a very useful and well-thumbed addition to this section of my library. It is a treasure trove of information about the British Army of the Napoleonic Wars. This book provides basic fundamental information about the army, not just a few examples but a comprehensive account in an easily accessible format. However, be warned, once you start browsing this book you will find it hard to put down! This is an invaluable reference book for anyone interested in the British army in this period. Whether you are pursuing your own line of study, or are simply a dedicated enthusiast of the history of the British Army, this book will be of immense interest and value to you. A treasure trove of information about the British Army of the Napoleonic Wars... If you want information about a campaign or details of the British Army units stationed in Britain, then this book will provide the information requirted, using over 300 tables and illustrations to do so... Once you start browsing this book you will find it hard to put down. It's hard to know what to say about this volume except to quote another reviewer of another tome: "How did we exist without this indispensable book?" The authors are well known to Napoleonic enthusiasts as meticulous researchers. It is more, however, than a simple collation of data. The material, much previously unpublished, is not only available for the first time in one volume, but it is very clearly and effectively laid out and explained, with a comprehensive bibliography and index, and is interspersed with fascinating and useful bits of trivia. This is a resource that has been wanted for a long time and will be invaluable to anyone with a serious interest in the British army of the period. It has all the hallmarks of a classic. Bob Burnham is the editor of the largest Napoleonic website and is the author of Inside Wellington’s Peninsular Army. He is currently working on a follow-up volume, "The French Army Against Wellington".